Australia ICOMOS has recently defined the term 'policy' in its draft Practice Note (April, 2013 – Version 1). The note explains that policy is used in the singular in the Burra Charter (Articles 6, 26.2, and 27.1) and is also commonly called 'conservation policy'. In the cultural heritage field these two terms are synonymous. Policy or conservation policy is short‐hand for all of the policies and actions needed to manage a place of cultural significance and retain its values. Developing policy is an essential prerequisite to making and implementing decisions about the future of a place. Conservation policy covers more than just physical conservation. Policy may include goals and objectives, strategies, recommendations and actions. Policy can address use, change, interpretation, governance, day‐to‐day management, decision making roles, conservation work, development or new work, maintenance, record-keeping and security. It should address all topics relevant to retaining the cultural significance of a place and its management into the future. Developing policy forms steps 3, 4 and 5 of the Burra Charter process as shown above. Developing policy can be complex, often requiring consideration of competing interests and values. 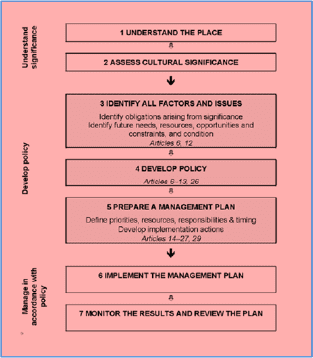 Policy is often developed as part of a conservation or heritage management plan or master plan for a place. Policy should include guidance about the implementation of the policy, and about monitoring the outcomes achieved. Policy needs regular review to ensure it remains up‐to‐date in the light of changing circumstances and the outcomes from its implementation. Policy arises from understanding cultural significance and taking account of all the factors affecting the future of the place. Policy is directed towards retaining the cultural significance of the place, first and foremost. Policy explains how places of cultural significance will be conserved. Policy brings conservation into all the activities of place management. Policy is only as good as the information and analysis that underpins it. There is often more than just one possible policy response to any set of circumstances. Even the best policy won’t last for ever; policies need to be reviewed and updated in response to changing circumstances. Other factors or future needs—the existing use/s, feasible and compatible uses, setting, location, contents, related places and objects.